Fish Creek, a tributary of the Snake River, is about 25 river kilometers long and is located in Teton County in western Wyoming near the town of Wilson. Local residents began observing an increase in the growth of algae and aquatic plants in the stream during the last decade. Due to the known importance of groundwater to surface water in the area, the U.S. Geological Survey (USGS), in cooperation with the Teton Conservation District, conducted a study to characterize the interactions between surface water and near-stream groundwater along Fish Creek. The study has two main objectives: (1) develop an improved spatial and temporal understanding of water flow (fluxes) between surface water and groundwater, and (2) use a two-dimensional groundwater-flow and heat-transport model to interpret observed temperature and hydraulic-head distributions and to describe groundwater flow near Fish Creek. The study is intended to augment hydrologic information derived from previously published results of a seepage investigation on Fish Creek. Seepage measurements provide spatially averaged gains and losses over an entire reach for one point in time, whereas continuous temperature and water-level measurements provide continuous estimates of gain and loss at a specific location. 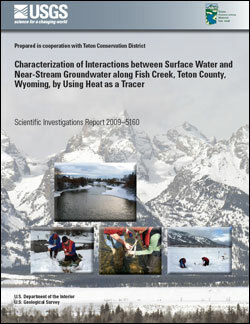 Stage, water-level, and temperature data were collected from surface water and from piezometers completed in an alluvial aquifer at three cross sections on Fish Creek at Teton Village, Resor’s Bridge, and Wilson from October 2004 to October 2006. The flow and energy (heat) transport model VS2DH was used to simulate flow through the streambed of Fish Creek at the Teton Village cross section from April 15 to October 14, 2006, (183 recharge periods) and at the Resor’s Bridge and Wilson cross sections from June 6, 2005, to October 14, 2006 (496 recharge periods). A trial-and-error technique was used to determine the best match between simulated and measured data. These results were then used to calibrate the cross-sectional models and determine horizontal and vertical hydraulic conductivities. The fluxes of groundwater into the stream or fluxes of stream water into the alluvial aquifer were estimated by using the calibrated VS2DH model for each cross section. Results of the simulations indicated that surface water/groundwater interaction and hydraulic properties were different at the three cross sections. At the most upstream cross section, Teton Village, Fish Creek flowed intermittently and continually gained relatively large quantities of water from April through September. During other times of the year, the stream was dry near the cross section. Saturated hydraulic conductivity set at 1x10-4 m/s in both the horizontal and vertical directions resulted in the best match between simulated and measured temperatures. The Resor’s Bridge cross section, about midway between the other two cross sections, was near the point where perennial flow begins. At this cross section, the stream gained water from groundwater during high flow in late spring and summer, was near equilibrium with groundwater during August and September, and lost water to groundwater during the remainder of the year. Horizontal hydraulic conductivity set at 5x10-5 m/s and vertical hydraulic conductivity set at 1x10-5 m/s resulted in the best match between simulated and measured temperatures. The Wilson cross section, the most downstream site, was at USGS streamflow-gaging station 13016450. This part of the stream is perennial and was almost always gaining a small volume of water from groundwater. Saturated hydraulic conductivity set at 1x10-4 m/s in the horizontal direction and at 5x10-6 m/s in the vertical direction resulted in the best match between simulated and measured temperatures. Quantitative values of the flux from groundwater into surface water were estimated by using VS2DH and ranged from 1.1 to 6.6 cubic meters per day (m3/d) at the Teton Village cross section, from -3.8 to 7.4 m3/d at the Resor’s Bridge cross section, and from 0.1 to 1.2 m3/d at the Wilson cross section. Monthly fluxes ranged from 16 to 199 cubic meters per month (m3/month) at the Teton Village cross section, from -114 to 222 m3/month at the Resor’s Bridge cross section, and from 3 to 33 m3/month at the Wilson cross section. Specifically, the Teton Village reach is strongly influenced by two factors: (1) snowmelt in the basin directly upstream and (2) large fluctuations in the water table. The Resor's Bridge reach is influenced by a combination of (1) a rise in groundwater level likely due to both infiltration of valley snowmelt and recharge to the alluvial aquifer along the west bank from the higher stage of the Snake River, (2) a snowmelt pulse from the mountain range to the west, and (3) recharge from irrigation water infiltration. Summer streamflows in the Wilson reach are maintained by streamflow in the upper part of the creek, tributary inflows, and a small, constant input of groundwater. Winter streamflows in the Wilson reach have similar inputs, except that tributary inflows are minimal. The qualitative patterns of gain and loss are in general agreement with qualitative results from previous investigations. However, this study provides quantitative information that can be used for future studies of Fish Creek, such as nutrient budgets, simulation of surface-water and groundwater flow, and simulation of surface water/groundwater interactions in the southwestern area of the Jackson Hole valley. Eddy-Miller, C.A., Wheeler, J.D., and Essaid, H.I., 2009, Characterization of interactions between surface water and near-stream groundwater along Fish Creek, Teton County, Wyoming, by using heat as a tracer: U.S. Geological Survey Scientific Investigations Report 2009–5160, 53 p.